Tieks and Why Every Teacher Needs at least 4 pairs! 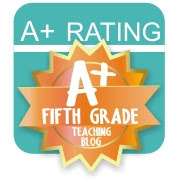 Today I want to share more reasons why EVERY female teacher needs at least four pairs of Tieks. I know you're thinking, "seriously?! four pairs?!". Yes, I'm serious and I will tell you why! Back in late March I had the opportunity to get my first pair after countless discussions with the mister and I was instantly smitten with my mustard yellow beauties. The shoes are beautiful, functional, and down right comfortable for the long hours of standing on your feet. You can read more about my first experiences with Tieks by clicking here. 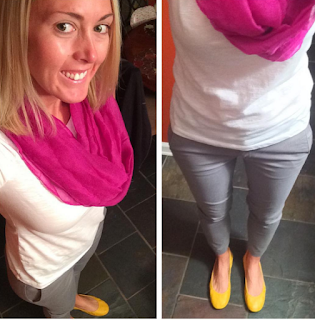 In August, I was again able to work some magic with the mister to get a second pair of Tieks. This time I chose leopard and again, fell instantly in love with them. It was hard trying to balance which shoes to wear because both were so beautiful, comfortable, and different from anyone else I came in contact with. It's always fun to occasionally have something other's don't, right?! 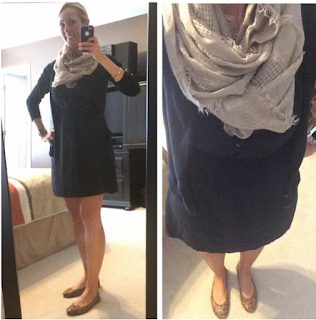 Leopard Tieks with a summer dress turns into a fall outfit with a cardigan and a scarf. On Thursdays I'm comfy at school with just the basics. I'm thinking this outfit would work with either pair of Tieks I have. Now, fast forward to mid October where closed toe shoes are almost a necessity with cold mornings and mild afternoons. Prior to owning a pair of Tieks, I always tried to find something comparable to wear to work that was a ballet style flat. I actually had two different pairs of "tiekish" styled shoes I wore all of last fall/winter. 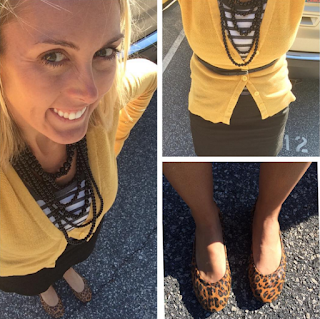 This fall I decided to get them out to add to the rotation because it's become challenging to design every outfit I own around mustard yellow and leopard. I figured I needed to buckle down and wear my black and tan/camel flats until I could once again work some magic with the mister for another pair of Tieks. Well, my friends...I learned two specific things this week. First, there is NO comparison to Tieks. You may think you're getting something like Tieks; however, you're not...no matter what you may be thinking. I put on my "tiekish" shoes this week and was instantly saddened by how uncomfortable they actually are. I had no idea how much support and comfort the Tieks provided until I tried on a pair of non-tieks! The second thing I learned is I need a pair of chestnut and a pair of black Tieks to somewhat complete a basic collection of everyday shoes, but would love to splurge and get the teal, fuchsia, taupe, and navy; however, that is only WISHFUL thinking. Unfortunately, like I mentioned in a previous post, my husband is losing his job next month (my birthday month); therefore, there are no new Tieks in my immediate future. Currently, he hasn't secured his next racing gig, so money will most likely be tight this holiday season. We have our little nugget to ensure has a magical Christmas...meaning no new shoes for this momma! When I came to this realization the other night in living room, my husband looked at me and asked why I didn't get "normal" colors the first time around? Why did I have to choose yellow and leopard? I quickly responded that Tieks has all kinds of fun prints and colors. I needed to choose "fun" shoes since anyone and everyone has brown and black. I also told him I thought my "tiekish" shoes would work, but I was WRONG friends! There is no comparison! So now, I'm up a creek "barefoot" until once again my hubs has a job and things settle out in our household. I never would have thought we would be in this position, but I strongly believe our God is a loving God who will take care of our family. I will continue to try to build outfits around yellow and leopard until once again I can purchase a pair of black Tieks. My suggestion to each of you is to first purchase your basics (black and/or chestnut or brown). Then purchase the fun! You may think you don't need the basic colors, but you will quickly figure out you do need them. Once you go "Tieks" there's no turning back!